He was left-handed, wrote using mirror-writing (writing backwards), and sometimes wrote in code in his journals. 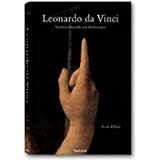 Leonardo da Vinci, the “Renaissance Man” and “Universal Genius” was an engineer, architect, inventor, sculptor, scientist, painter, and musician. He is considered one of the greatest painters, inventors, and creative thinkers the world has ever seen. It took him four years to paint the Mona Lisa and he invented the robot, the helicopter, the bicycle and the airplane. Some of his famous paintings and drawings include the Mona Lisa, The Last Supper, and the drawing Vitruvian Man. He was a vegetarian for humanitarian reasons which were partly due to his study of the human body and muscles. Bruce Lee many years later become vegetarian to optimize his body in speed and muscle strength. Isaac Newton, Steve Jobs, Albert Einstein, Thomas Edison, Charles Darwin, Benjamin Franklin, Mahatma Gandhi, Henry David Thoreau, Vincent Van Gogh, Steven Spielberg, Marc Twain, and Jacques Cousteau were also a vegetarians. Although Leonardo used mirror writing frequently in his journals starting on the right and moving to the left, he could also draw with one hand and write with the other at the exact same time. He recorded his ideas, drawings, and inventions in notebooks, totaling some 13,000 pages of notes and drawings. In comparison Albert Einstein had 40,000 documents. Designed the first known robot in history. Invented the first bicycle, flying machine, and calculator. Some of his inventions include covered tanks, helicopters, hang gliders, airplanes, parachutes, machine guns, submarine, worm gears, pumps, calculators, scissors, and contact lenses. Leonardo’s conception of concept lenses in 1508 was followed by René Descartes in 1636 and finally into plastic lenses by an optician Kevin Tuohy in 1948, 440 years later. Leonardo’s foray into robots was finally turned into the beginnings of reality by Nikola Tesla in 1898. Isaac Asimov would later write books about robots and derive the three laws of robots: 1. A robot may not harm a human being, or, through inaction, allow a human being to come to harm. 2. A robot must obey the orders given to it by human beings except where such orders would conflict with the First Law. And 3. A robot must protect its own existence, as long as such protection does not conflict with the First or Second Law. The airplane would become a working reality in 1903 by the right brothers, later to be experimented and further developed and streamlined by Howard Hughes, and then breaking the sound barrier by Chuck Yeager in 1947. Leonardo’s was the first to invent the a parachute followed by Jean Pierre Blanchard in 1785, and then twelve years later, jumping from a balloon, Jacques Garnerin survived the first successful descent of 3,000 ft and in 1912 surviving the first successful descent from an airplane was Captain Albert Berry of the US Army. He also designed canals, bridges, and buildings. He also created and drew three-dimensional geometrical shapes, one being a rhombicuboctahedron, Buckminster Fuller would also venture in the same arena, and create the geodesic dome. He had 17 half brothers and sisters. Michelangelo was twenty-two years younger than Leondaro, but surpassed his years and died at 88, on the same day that Galileo Galilei was born. Later in life in 1517 he had a stroke and suffered from a paralysis of the right hand. "Great minds often produce more by working less, for with their intellect they search for conceptions and form those perfect ideas which afterwards they merely express with their hands,"
William H. Gates III (Bill Gates) owns one of Leondardo’s manuscripts (1506-1510) called the The Codex Leicester. The Codex is written on linen paper, has seventy-two pages with over 300 pen and ink drawings. May 2, 1519: He died in France in the Château de Cloux, near Amboise under the service of King Francis I. Sixty beggars followed his casket and was buried in the Chapel of Saint-Hubert in the castle of Amboise. There was a story created after his death that King Francis upon hearing of his poor health rushed o see him and Leonardo died with his head being cradled by the King. In reality the King was away celebrating the birth of his second son.